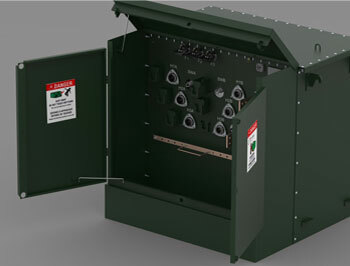 The Cam Tran dead front padmounted transformer can be manufactured to most North American specifications. 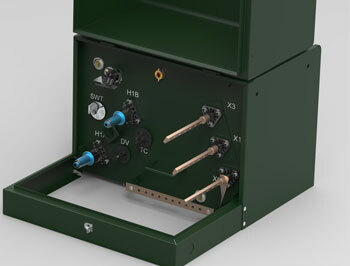 The more popular styles are: Loop feed units made to either CSA, ANSI, REA, or CEA standard. Unique to Cam Tran is our “user friendly” ergonomic “Full Length” cabinet handle lift for ease of handling and to reduce injuries. 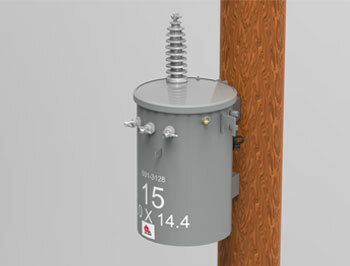 Cam Tran overhead transformers can be manufactured to meet most specifications. Standard design is 1-HV bushing manufactured to meet CSA, ANSI or REA standards. They can be provided in either mild steel or stainless steel tanks. There are a number of additional coating options to combat corrosion that we would look forward to discussing with you upon request. Cam Tran’s 3 Phase dead front padmounted transformers can be provided in either radial feed or loop feed configuration and will meet or exceed most North American standards, including CSA, ANSI, REA, and CEA specifications.